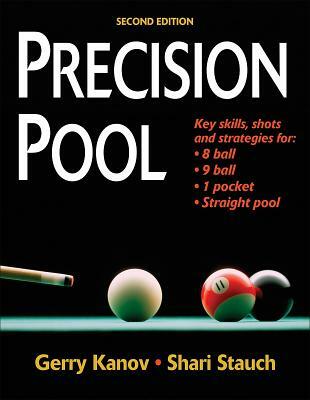 Sharpen your strategy and shot-making skills Whether it's eight ball, nine ball, straight pool, or one pocket, Precision Pool will reveal the secrets the pros know in this attractive full-color offering. Authors Gerry "The Ghost" Kanov and Shari "The Shark" Stauch leave nothing to chance, sharing the wealth of experience they gained from coaching or competing against virtually every top professional player. The result--Precision Pool--is simply the most comprehensive and useful book ever written on pool. Gerry "The Ghost" Kanov and Shari "The Shark" Stauch combine an unprecedented wealth of professional pool experience and talent to create this book. Both are staff members of Pool & Billiard Magazine, the top publication for the sport. They have played and worked with virtually every top professional pool player and instructor in the world.Kanov has been playing professional and amateur pool since 1968. He has dozens of local and national top 3 finishes and championships, including two national team championships as a player and coach. He is an instructional editor and technical advisor for Pool & Billiard Magazine and has written dozens of instruction articles, including the popular "Ghost" and "Eight Ball Ernie" columns, P&B reader favorites.Kanov was a touring professional on the Camel Pro Billiard Series and a coach for several top players. He also has a screen credit: He portrayed a referee in the motion picture The Color of Money. Kanov and his wife make their home in Nashville, Tennessee.Stauch, a member of the Women's Professional Billiard Association (WPBA) Hall of Fame, was a touring pro on the Women's Pro Billiard Tour from 1980 to 2004, when she retired to pursue promotion of the sport full time. She was consistently ranked in the top 32 players in the world, even while serving as executive editor of Pool & Billiard Magazine and handling publicity for the Women's Pro Billiard Tour. She has performed dozens of exhibitions for clients, including Gordon's Gin and ESPN.Stauch was the founding president of the Billiard Education Foundation, which conducts youth billiard national championships and scholarship programs. Stauch also was involved as a consultant for The Color of Money. In 2003 she was selected as the billiard mentor for You Can Do It, a book conceived by United Flight 93 heroine Lauren Catuzzi Grandcolas to inspire women to try new sports and hobbies. Shari resides with her husband and two children outside of Charleston, South Carolina. Together, Kanov and Stauch authored the first edition of Precision Pool as well as Pool Player's Edge: Advanced Skills, Shots, and Strategies for 8-Ball and 9-Ball. For more on the authors, including archived articles, visit www.PoolMag.com.